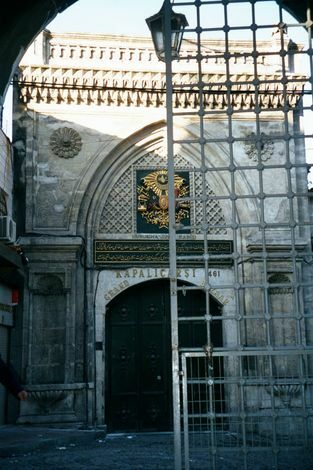 Established in the fourth century by Constantine on the site of the older Byzantium, Constantinople kept its name even after the Muslim conquest of 1453. 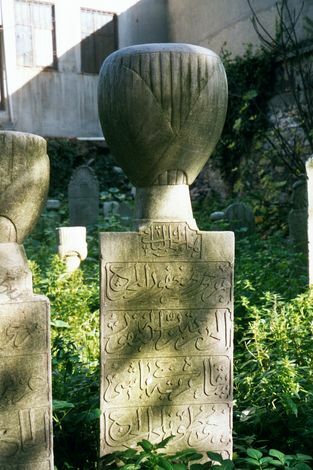 The name Istanbul came at that time into colloquial usage along the older name. Finally, in the heady early days of the Turkish republic, Kemal Ataturk put his foot down and told the post office to return all mail addressed to Constantinople. That did the trick. 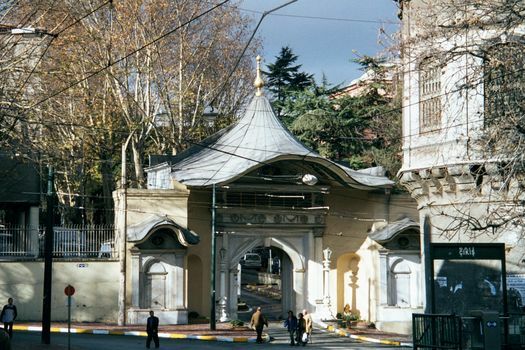 A short walk uphill from the Sublime Porte, the Milion is a milestone going back to the distant days before the Ottomans to the Byzantine empire, when imperial distances were measured from this point. Underneath that stone, the Byzantine emperor Justinian built a cistern in the 6th century. 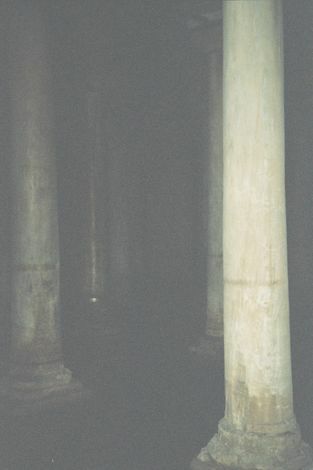 It's known informally as the sunken palace, and the 300-plus columns are certainly suggestive of a palace, but it's never been more than a sunken reservoir. 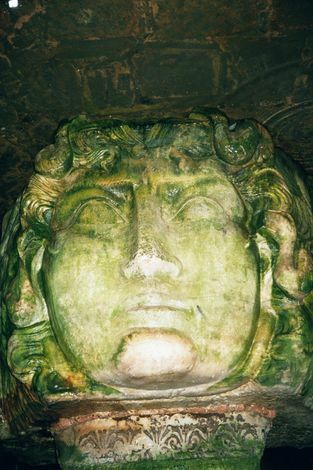 One of the columns in the cistern includes, at its base, this recycled Medusa head. 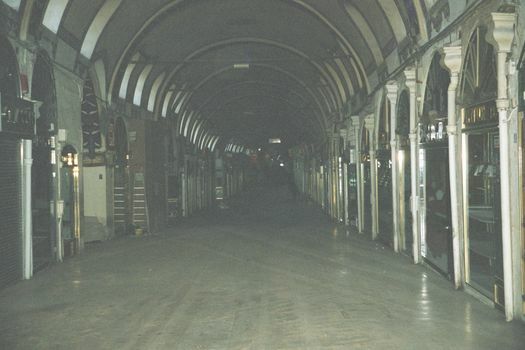 Its original location is unknown. 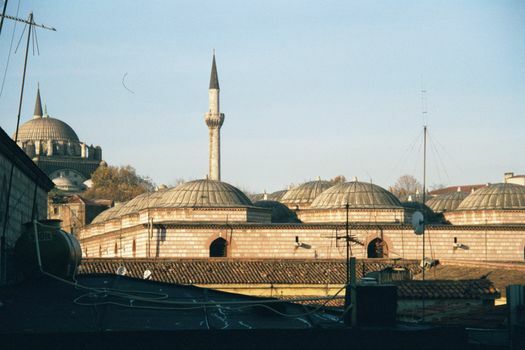 Across the street from the cistern and Milion, there's a large open space fronting on the Blue Mosque. 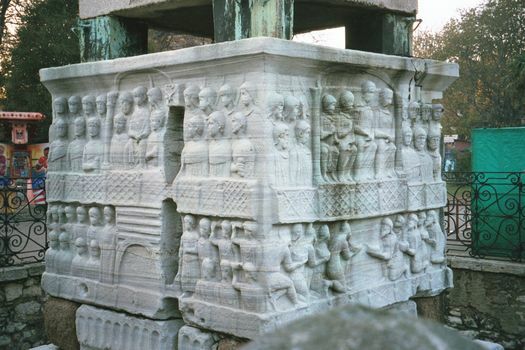 In Byzantine times it was a hippodrome or stadium to watch horse races. 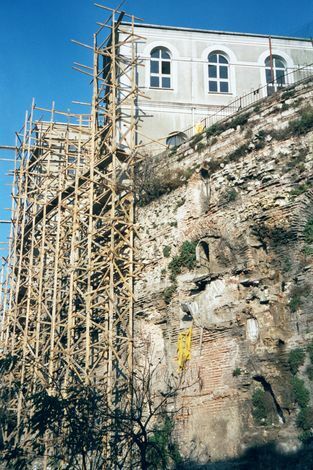 At its south end, there's a steep slope down to the Sea of Marmara. Walk down the slope, and you'll notice this cliff. At least that's what it seems to be, until you notice the curvature, the brick, and the arches. You could pass it ten times without realizing what it is, but the eleventh time it will dawn on you that it's the base of one end of the hippodrome. It has a name, of course: the Sphendoneh. 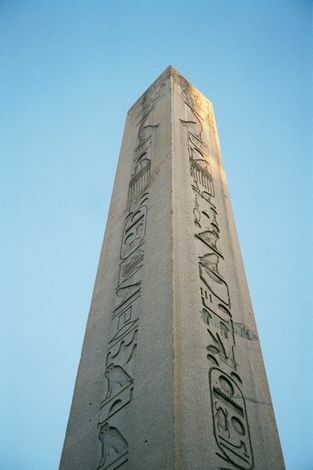 Back up on the circuit of the hippodrome, there's an obelisk built in the 15th century, B.C., by Thutmose III. Almost two thousand years later, it was lugged here from Heliopolis, near Cairo, by the emperor Theodosius. 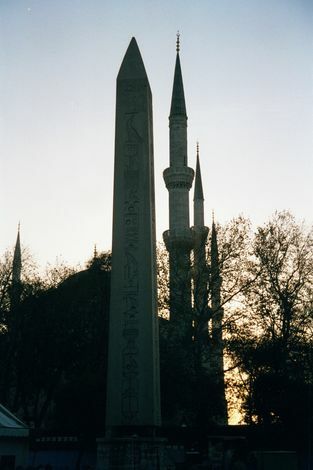 Hence its name, the Obelisk of Theodosius. 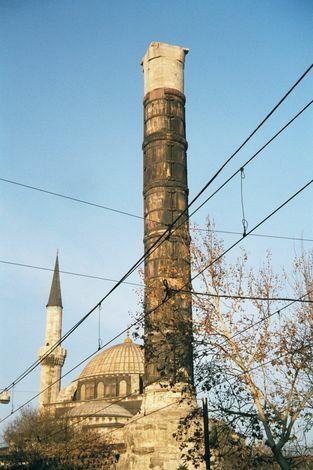 The minarets belong to the Blue Mosque. 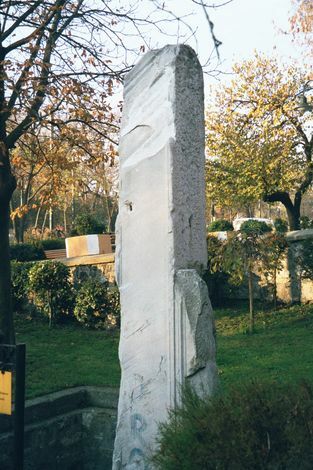 Perhaps the most astonishing thing about the obelisk is its perch atop four small bronze blocks. Would you think the metal could be so strong and durable? Still within the hippodrome there's this graceful kiosk. Ottoman? No. Then what? 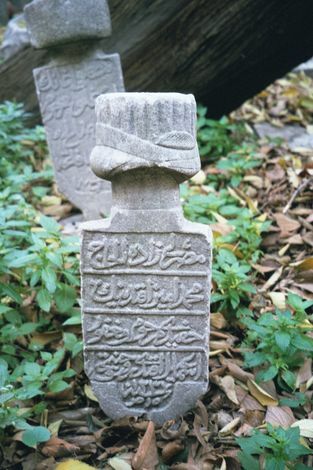 Would you believe it was given by Kaiser Wilhelm II to Sultan Abdul Hamid in 1900 as a momento of the kaiser's visit to Istanbul two years earlier? (The kaiser was a good friend of the sultan's, at least to the extent that heads of state have friends.) 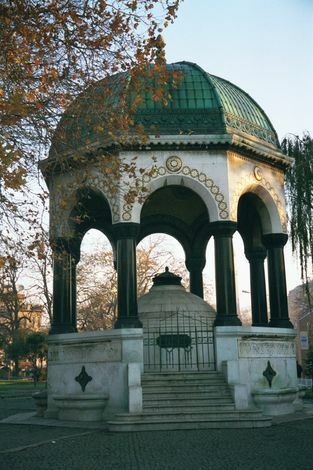 Despite its neo-Byzantine style, the fountain was designed by Max Spitta, most of whose career was devoted to churches in Berlin. It was made in Germany, too, and shipped here in pieces. The Cemberlitas from a distance. It's composed of 70-ton drums of porphyry mined at Jebel Dukhan, between the Nile and Hurghada on the Red Sea. 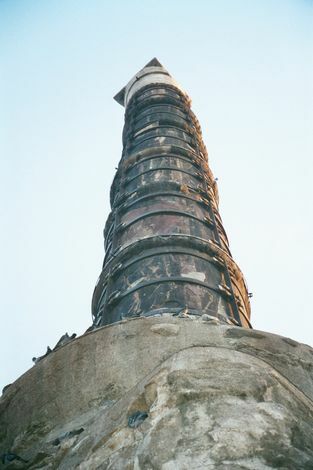 From Constantine's viewpoint, of course, this wasn't imported stone: it was stone from within the Empire. 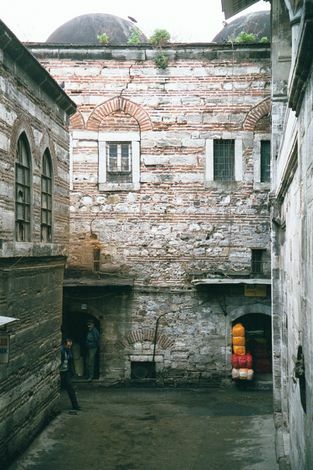 The Cemberlitas is at the main entrance to the famed Kapalikarsi or covered market, which would die without foreign tourists. The market's roof in the light of a new day and from the Nuruosmaniye mosque. 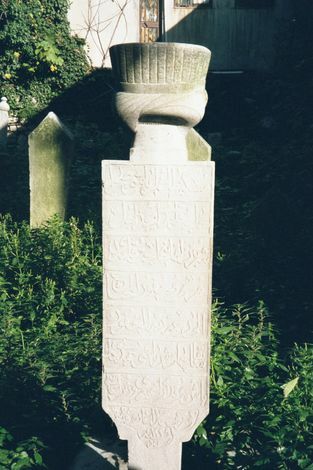 Another type, styled perhaps in accordance with regimental traditions. 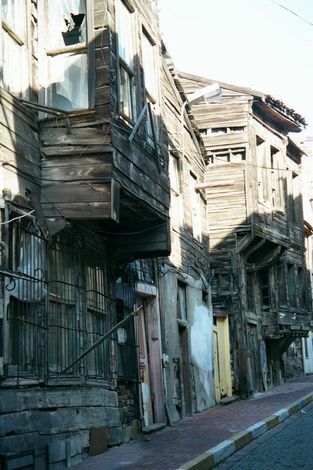 A nearby street, lined with the wooden buildings common in Istanbul. The tombstones are in considerably better shape.